Some food products are obviously susceptible to foodborne illness, and cooks know to treat them with care. Eggs, dairy products and perishable meats and seafoods fall into that category, and cautious cooks diligently rinse their salad greens and sprouts. Rice is a less obvious candidate for causing illness, but it's also a potential vector for a number of unpleasant microorganisms. If you prepare it in volume, or if you regularly cool and reheat it, it's important to take appropriate precautions. Rice and other uncooked grains are relatively impervious to potentially harmful microorganisms, or "pathogens," because they're so dry. Like other living things bacteria and molds require a certain amount of water to live, and properly stored grains don't usually contain that much moisture. When the rice is cooked, that changes. Cooked rice is warm, humid and filled with nutrients that are just as useful to bacteria as to humans. In effect, it becomes an incubator providing ideal growth conditions. Minimizing the risk of foodborne illness requires close attention when cooking, cooling and reheating your rice. Before cooking any rice, inspect it visually. If it shows signs of contamination by liquids, discard it. Rice that's visibly dirty, moldy or damaged by insect or rodent pests should also be discarded immediately. Cooking rice by any method raises to a temperature near boiling, killing any live bacteria, but some pathogens will survive as spores. If the rice is kept warm it must stay over 140 degrees Fahrenheit to remain food safe. At lower temperatures bacteria such as the rice-loving Bacillus cereus can quickly colonize the pot. If it's not stirred and fluffed, it's also possible for C. botulinum to reproduce in the airless environment and produce the toxin responsible for botulism. If you're preparing enough rice for leftovers, it's important to cool it quickly once it's removed from the heat. The fastest method is to scoop your rice out into a large bowl or flat baking sheet. Toss and separate the rice as it cools with clean utensils or gloved hands. This helps it cool faster, and exposing your rice to air prevents botulism. Once your rice has cooled to room temperature, package it in small servings in individual bags or flat containers. Refrigerate or freeze the rice as soon as possible, ideally within an hour of cooking. It's safest if used within two to three days, though rice can be refrigerated for six days or longer under ideal circumstances. Frozen rice has an indefinite shelf life, but will lose quality over time. It's best when eaten within four to six months. Thaw it overnight in the refrigerator, or if you'll be cooking it immediately you can use your microwave. 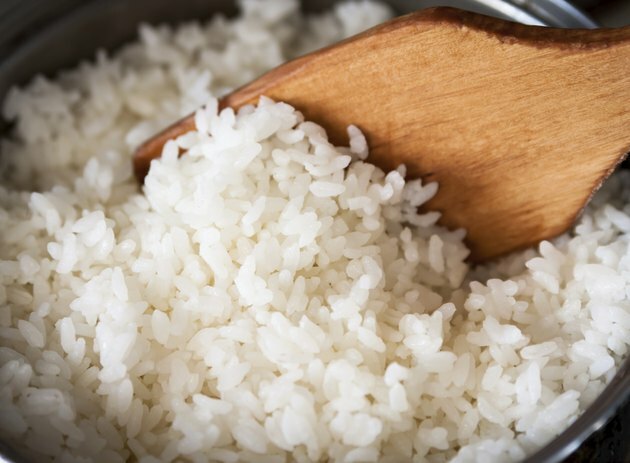 To be food-safe, the rice must reach a consistent temperature of 165 F throughout the dish. This holds true whether it's reheated on its own, or as an ingredient in a casserole or other dish. Rice should only be reheated once, so any remaining leftovers should be discarded.